Originally designed for FAO, 8" Eloise is dressed for new adventures in blue twill pants and a white cotton sailor shirt with blue cuffs and collar. 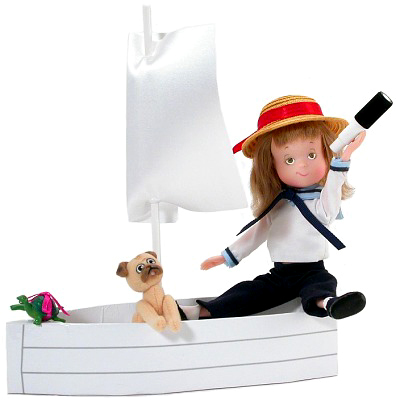 A straw hat with red ribbon trim completes her nautical outfit. Eloise carries her telescope as Weenie and Skipperdee go sailing with her in their boat made for three! Limited Edition of 1000. Available only at The Matilda Company.